The president’s campaign is collecting opposition research on Kamala Harris, Elizabeth Warren and Cory Booker. Trump himself has his eye on Joe Biden. Donald Trump’s political advisers are homing in on three declared Democratic candidates who they believe are the most viable at this early stage of the campaign. The reelection campaign has begun compiling opposition research on Kamala Harris, Elizabeth Warren and Cory Booker and is eyeing opportunities to attack them. The effort began over the weekend when the Trump campaign sent out a news release ahead of Warren’s launch criticizing her past claims of Native American heritage. Trump’s advisers are certain the list of announced Democratic candidates will grow exponentially before the first primary debate in June, and that their targets are certain to fluctuate over time. Yet the early assessment provides a window into how Trump world views the emerging Democratic field — a sprawling, largely undefined group that lacks a clear front-runner. Interviews with more than two dozen of the president’s closest advisers reveal that the Trump operation is watching the opening days of the Democratic primary with a mix of relief over the field’s sprint to the left, surprise over Harris’ impressive launch, and trepidation over the prospect of Joe Biden and Sherrod Brown threatening Trump’s Midwest stranglehold. Trump has told allies he sees Biden, who remains undecided on a 2020 bid, as the most formidable potential general election rival. The president has said privately that Biden would appeal to a wider swath of voters than other Democratic hopefuls. Yet among the president’s inner circle, there’s widespread doubt that Biden could survive a primary, after a three-decade political career and positions on issues such as the Iraq war and crime that are anathema to liberals. Many are convinced that whoever emerges from the Democratic primary will be an out-of-the-mainstream liberal — someone who either hails from that wing of the party or or has taken pains to align themselves with it. 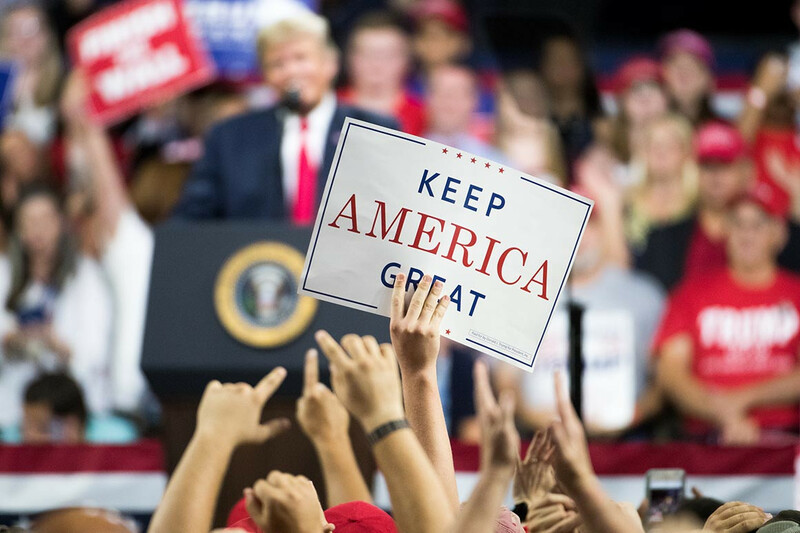 “Based on what we’ve seen so far, between the direction of the party and pressure, it will be difficult for them not to take a position which won’t be counter to their base,” said Brian Walsh, the president of the pro-Trump America First Action super PAC. That calculation has helped to shape an early and aggressive PR campaign aimed at branding Democrats as supportive of far-left policies and calling them socialists. The president introduced the theme during his State of the Union speech and reiterated it during his Monday rally in El Paso, where he railed against a range of policy areas animating the left, including immigration, taxes, and climate change. At both events, the president accused Democrats of supporting late-term abortion. At the same time, Trump’s political aides — who’ve been spitballing about the Democratic candidates at their Rosslyn, Va., headquarters — are keeping an eye on candidates who could appeal to the liberal base while also making inroads into the president’s blue-collar base. Some are convinced that Brown, who last year comfortably won reelection in Ohio, could fit that bill. Others are monitoring Harris, a first-term senator who drew thousands of supporters to an Oakland campaign launch — a well-choreographed event that drew the notice of the rally-obsessed Trump team. Reed, a veteran of presidential politics who helped to spearhead the Swift Boat Veterans for Truth attacks on 2004 Democratic nominee John Kerry, contended that Harris would get a boost by California’s decision to move its primary earlier in the calendar. Trump’s campaign brain trust also sees Warren and Booker as potentially formidable primary candidates: Warren because of her liberal following and populist pitch, Booker in part because of his donor base. Other declared candidates, like Kirsten Gillibrand and Amy Klobuchar, were seen as having more limited national profiles. Trump allies insist it will take a Democratic figure with serious star power to take out the larger-than-life president. Others Trump allies, though, insist it will take a Democratic figure with serious star power to take out the larger-than-life president. That person, Gaetz contended, could be Beto O’Rourke, who on Monday evening held a counter-rally in El Paso. “Whether people agree or disagree with Beto, he speaks with an authentic voice,” said Gaetz, who served with O’Rourke for several years in the House of Representatives. With the campaign still at a nascent stage, Trump aides say they haven’t fully focused on the Democratic field. Instead, much of their attention has been centered on developing a nationwide apparatus. In recent weeks, they have been interviewing applicants for a range of positions — from press and communications to field canvassers. Yet some Trump allies are beginning to take an interest. America First Action, the principal pro-Trump super PAC, recently conducted a survey to see how would-be Democratic candidates would fare against the president in Florida. Trump aides are deeply cognizant of the president’s vulnerabilities. Yet the lack of a prohibitive front-runner has heartened senior Republicans, some of whom are growing convinced that Democrats lack a singular figure who has the prominence and political skills needed to knock off an incumbent president. During a Senate GOP-sponsored retreat at the luxury resort The Breakers in Palm Beach last weekend, major donors gossiped about a range of negative stories plaguing Democratic candidates — from reports of Amy Klobuchar’s mistreatment of staff to Warren’s bungled efforts to address the Native American heritage controversy. After a devastating midterm election, one attendee said, it felt as though the pressure on the party was receding. Some White House aides think the eventual Democratic nominee will be a wild card who emerges later, after the initial slate of contenders stumble. One senior administration official mentioned former Virginia Gov. Terry McAuliffe as a possibility, while another person who speaks frequently with the president described Michael Bloomberg, a billionaire former New York City mayor, as a potential threat.